Don’t lose selling time due to an inaccurate compensation structure. CSO Insights’ ICPM study* found that 69 percent of organizations use three or more metrics to build their sales compensation plans, but modeling and planning this sales strategy can quickly become too complex as a spreadsheet-driven exercise. It is crucial to get these incentive compensation structures right, because sales reps receive up to 60 percent of their income from incentive comp. 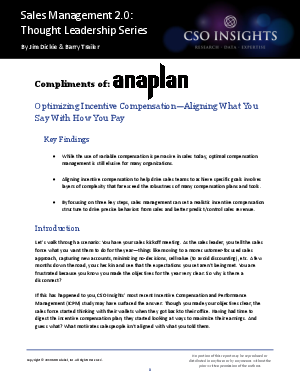 In this white paper, we discuss the disconnect between sales behavior and incentive compensation structure and provide recommended steps towards optimizing your compensation plan.